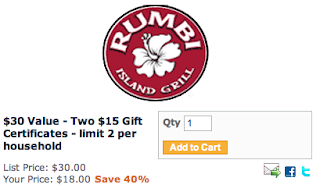 $18 for $30 worth of Rumbi Gift Certificates! Right now you can get TWO $15 Rumbi Gift Certificates for $18.00!!! These will probably sell out like they did last time so hurry if you want one. Use code wallflowers to get FREE shipping! The certificates are valid at ALL locations nationwide! !